The colour change of Pastel Splendor is a magical spectacle. At first, the bud is lavender, but it slowly gets a pink color and ends up with a cream heart. Beautiful to look at and even more beautiful at parties. The transformation of colours is one of the most special properties of peonies. Some peonies undergo more colour changes than others, like Pastel Splendor. This peony starts with a lavender bud which transforms to pink and when the flower opens up, she shows her creme heart. Truly magical, especially when you are not expecting it. Pastel Splendor blossomed for the first time in 1988. She was discovered by breeders Seidl and Anderson. They registered the peony in 1996. 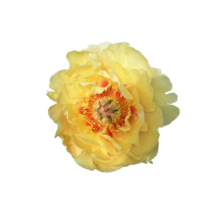 Seidl is the founding father of many peonies, such as Carnation Bouquet and Pastelegance. Itoh peonies as Pastel Splendor are lactiflora and tree peony cross-breeds. Unfortunately, Itoh peonies are notorious for their short shelf life. That’s the reason why they are barely available. To lengthen the life of Itoh peonies, we invested in new nutrition. Because of this nutrition, we can guarantee you can keep your Itoh peony in the vase for four days. This makes her the ideal extravagant flower for your party.